The rotator cuff is a group of four muscles (subscapularis, supraspinatus, infraspinatus and teres minor) in the shoulder that originate on the scapula (shoulder blade) and attach to the humerus (upper arm bone). They move and stabilize the shoulder as it travels through various ranges of motion. The supraspinatus is the most commonly injured rotator cuff muscle, partly because the tendon of this muscle passes through a very narrow space between the top of the humerus and the underside of the acromion. As we age, the muscles and tendons of the rotator cuff become less pliable and elastic making them more susceptible to tearing and irritation. Activities once performed without issue may now result in pain, inflammation and potential tearing. Individuals below the age of 40 can also injure their rotator cuff muscles, but this is more commonly associated with an acute injury such as a fall, fracture or dislocation, or frequent overhead use of the arms in activities such as tennis, painting, or construction. There are varying degrees of rotator cuff tears including tears in the tendon, muscle belly, or at the muscle’s insertion point on the bone. Strain: An injury to a muscle or tendon. Ligaments: Connects bone to bone. Tendons: Connects muscle to bone. If nonsurgical options fail to provide relief or if your rotator cuff tear is too substantial, your orthopedic specialist may recommend surgery. 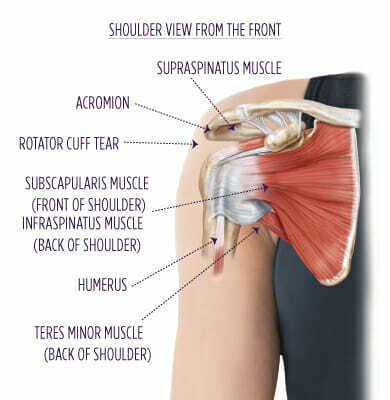 There are several different techniques to repair a torn rotator cuff. The decision of which technique is appropriate depends on the shape, location and severity of the tear. It is the least invasive and involves three small incisions in the front, side and back of the shoulder. The tear is visualized and repaired using a tiny camera and tools passed through the incisions. Open repair is done through an incision one to two inches long made over the area of the torn muscle. This allows your specialist direct access to the tear through which the damaged tissues can be repaired. Once you decide on surgery, your orthopedic specialist will discuss the type of repair most appropriate for your injury. After surgery the shoulder and arm will be immobilized in a sling up to six weeks. This is necessary so that the repaired tissues have time to heal. Many patients are able to leave the hospital the same day as surgery. However, if your health is complicated by other factors your doctor may wish that you remain overnight for observation. This decision is made on an individual basis with your specialist. Following surgery, you will be given instructions regarding care of your bandages and use of the sling. You need to wear the sling full time during this period, unless instructed differently by your specialist. After first post-op appointment, barring complications, you can take off the sling for showering, getting dressed and prescribed exercises. You can expect to be in the sling for four to six weeks. This will vary depending on individual factors such as the nature of your tear and personal health. At your first post-op appointment your specialist will review their recovery plan and discuss these issues with you. After surgery your specialist may prescribe a Constant Passive Motion (CPM) Machine. This machine is a chair that you sit in while the shoulder is moved through a predetermined range of motion. If your specialist wants you to use a CPM, a DME technician will contact you around your first post-op visit to set up delivery and explain its use.